You don’t have to spend a fortune to get yourself a good guitar these days. Cheaper technology and Overseas manufacturing are making guitars more affordable. 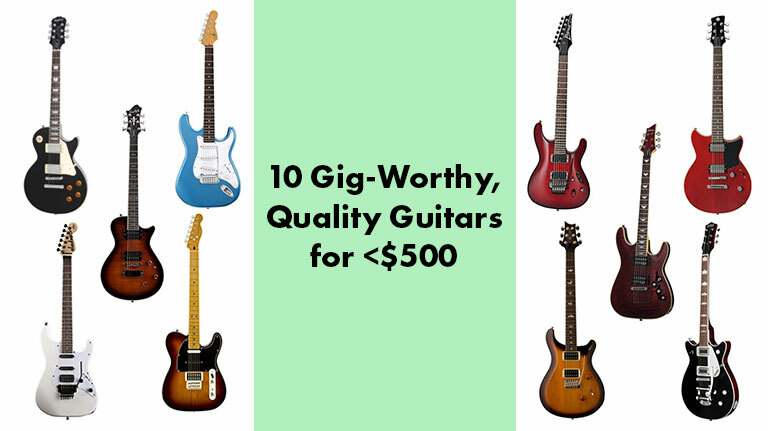 Most of these guitars are the “affordable” line of a brand. Similar to how cars are marketed. The Epiphone / Gibson lines are equivalent to say Honda / Acura or Toyota / Lexus. Not everyone can afford Acuras or Lexuses, but the good news is that Hondas and Toyotas are still great cars. Paul Reed Smith has enjoyed a great reputation for years. The SE product line offer a great value. This model includes locking tuners, push/pull tone control, and a rosewood fretboard with bird inlays. I have a PRS SE Standard and I’ve gigged with it many times. Very solid guitar. The Epiphone Les Paul is well-known for its value. I’ve seen many guitar players using this guitar as their workhorse for gigging. Plays great, sounds great and stays in tune. G&L guitars don’t get the attention they deserve. Founded by George Fullerton and Leo Fender in the 1970’s, G&L make really high quality guitars. The tribute series are their “budget” line, comparable to Fender MIM Stratocasters and Telecasters. I have a G&L ASAT Tribute “Tele” that is my main gigging guitar – I love it. A great looking and great playing guitar, the Ibanez s520 is another great value. This shredder has a Wizard III maple neck with a rosewood fretboard and an Edge-Zero II tremolo system. The Jackson Adrian Smith SDX features a Floyd Rose tremolo, and a humbucker-single-single pickup configuration. Check it out. The Schecter Omen Extreme 6 is a beautiful guitar with many great features. The quilted top finish and vector fretboard inlays look great. It also has push/pull coil splitting on the pickups. The Fender Modern Player Telecaster is a very versatile guitar. It boasts a humbucker in the bridge, a Strat pickup in the middle and a Tele pickup in the neck position. there’s also a mini-toggle that allows you to split the coil on the humbucker. The Yamaha Revstar RS-420 offers vintage looks and great workmanship. It features two humbuckers and their patented push/pull Dry Switch, which splits the coils but also improves the tone of the single coil when split. The Hagstrom Ultralux Ultra Swede is a great-playing, great-sounding, versatile machine. The Gretsch G5655T-CB is a solidbody with a chambered body, making it lightweight. Also features their Anchored Adjusto-Matic™ bridge.